I had such an amazing weekend... it may not have been the most productive one for me (I'm such a chatter! ), but it definitely revitalized my soul. 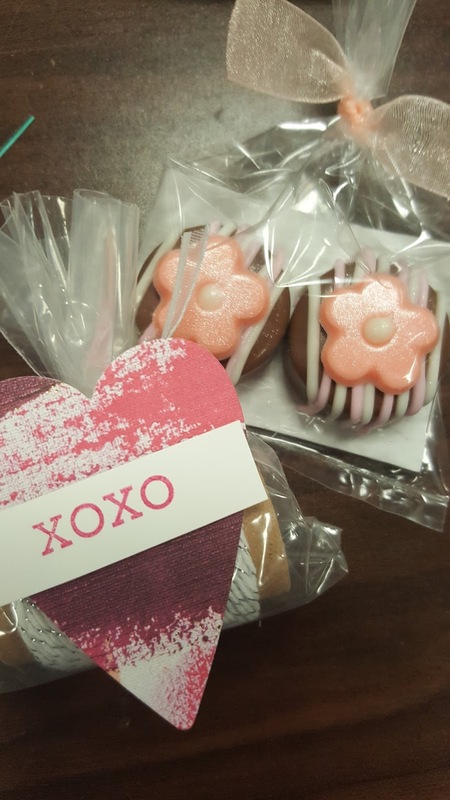 Each time we have a new Stampin' Up catalog (the new Occasions Catalog and Sale-A-Bration brochure launched on January 3rd! ), I host an all day stamping event for my team of Shore Stampers. Right now we have just under 40 of us on the team and we're spread out around the country. So I designed 16 projects for them (that can all be used in their business if they are building one, or just for fun if they love to stamp!) and we got together for a full day of crafting on Saturday. What I love about the January team event is we turn it into a "Stampover." So we finish the training at 4pm on Saturday, but then we hang out all night and through most of the day on Sunday working on our own projects and just laughing and having fun! 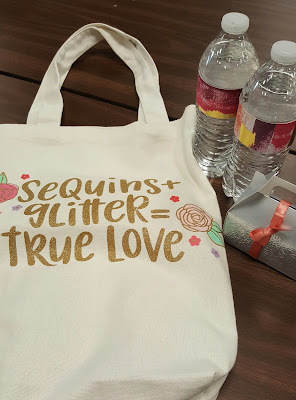 I had two different styles of goody bags for them... the flower one, and this one that says "Sequins + Glitter = True Love." How true, right?? Inside the bag was $25 worth of brand new Stampin' Up product that they used on their 16 projects that day. I also gave them each two bottles of water wrapped with the Painted with Love Designer series paper and their first pillow gift: an embossed gable box filled with a variety of Lindt chocolates. During the day I also have two demo presenters, and a display stamper or two. 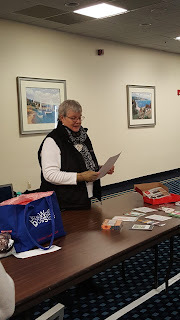 Linda (above) talked to the group about how to use Stampin' Up's monthly paper crafting kit called Paper Pumpkin to meet your quarterly minimums and even make some money. 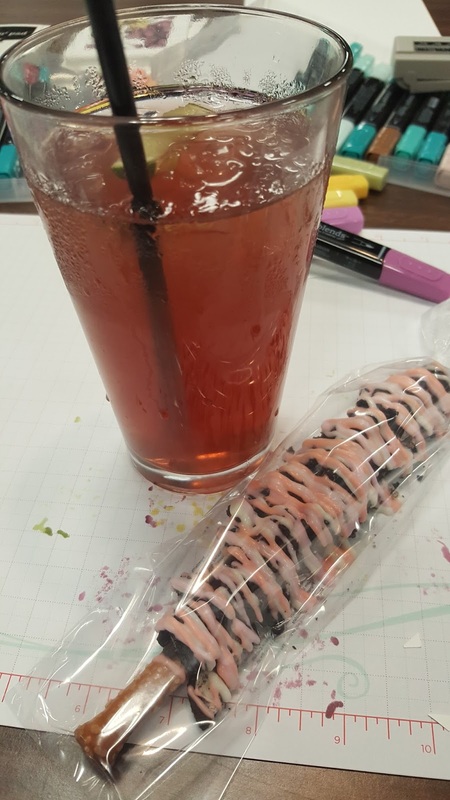 Donna also talked about Stampin' Up's corporate event called OnStage, but I totally forgot to take a picture! (wah!). We had a display stamper lined up as well, but sadly she got the nasty stomach bug that is going around so she wasn't able to attend. Such a bummer... we missed her lots! After lunch, I had another little pillow gift for them (a full roll of the new white and silver baker's twine) and a yummy little dessert treat from Stephanie's Sweet treats -- they were delicious mini chocolate covered oreos. 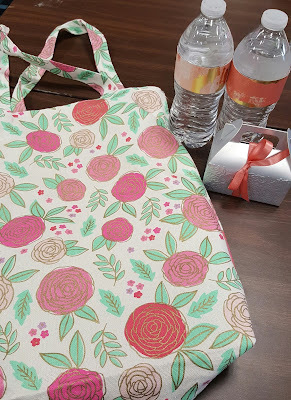 At the end of the day I gave them one more pillow gift - it was this cute little bag with the new Sale-A-Bration Memories & More cards (which you can earn with a $50 purchase for free!). 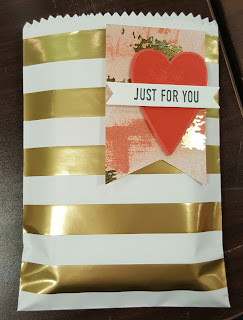 I will be sending my team a tutorial of how to make eight gorgeous cards with this product later this week as a bonus class they can make for fun or to use in their business! 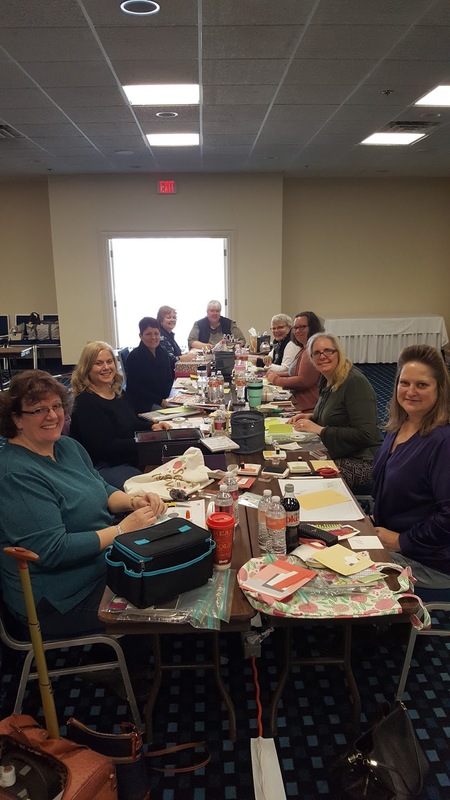 We also had a team swap on Sunday morning, where we all made cards using new Stampin' Up product and swapped them out with each other. Swapping is one of my favorite parts of being a demonstrator -- so many amazing ideas! I'll have to share those in a separate post. 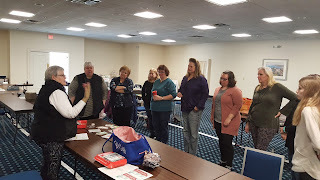 Overall, it was a wonderfully fun weekend and I can't wait to host another quarterly training event for the team in June with the launch of the new annual catalog. If you want to be a part of the Shore Stamper family, we'd love to have you join us! Right now is the best time to join as Stampin' Up is offering an even better deal than normal thanks to Sale-A-Bration! If you join before March 31, the starter kit is just $99 and you are able to select $125 worth of product of YOUR CHOICE with Free shipping. PLUS, you'll get to add two additional stamp sets fro FREE and of any value -- that means you could grab something like the "Letters for You" stamp set, which is $49, for free! Plus an additional stamp set, too! This is seriously the best deal in the book, but it also comes with so many more perks -- you can read all about those HERE. As always, let me know if you have any questions. I'm always happy to help -- my email is jen pitta (at) comcast (dot) net.